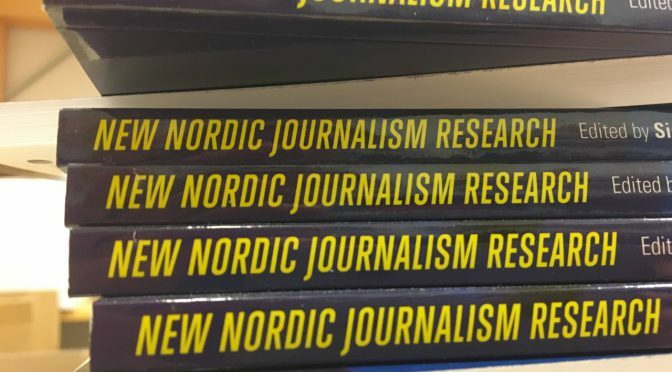 Want to start following the Nordic journalism and journalism education research more systematically? Or narrow down the monitoring of international studies to those conducted in the Nordic countries? Here are some essentials to teachers and students. What makes it often difficult to follow research related to journalism, journalism research and journalism education is the fact that the research is typically scattered around different disciplines such as sociology, political science, philosophy, educational sciences, cultural studies and, for example, economics and business studies. In today’s global culture it may also be increasingly irrelevant to draw lines between ”Nordic” and ”non-Nordic”. In a world of complex relationships, ”Norden” is becoming more and more interlaced with other geographically and culturally defined areas, or less relevant in favour of a more ”international” scope of attention and interests. This does, however – and luckily – not undermine the distinct Nordic identity; it may just make it slightly more difficult to trace the work of the Nordic-based scholars. As many of the academic journals nowadays follow an Open Access policy, original studies are easy to use on courses or for purposes of self-study. The communication about the Nordic-originated research has increased, enabled by a number of different platforms and organisations. In this post I want to collect some relevant sources for those who want to start keeping an eye on the Nordic media and communication research. The most important sources for following recent research are, of course, the academic journals. They can be found in the national databases (The Danish National Research Database, Jufo in Finland, DHB in Norway). A common Nordic database is currently under construction. Besides the national journals typically given out by the researchers’ associations and the international journals open to scholars all around the globe, there are academic publications with a distinctively Nordic scope. Below is a list of the academic peer-reviewed journals published in English and/or Scandinavian languages, relevant to and influential within the field of media and communication research, and, more specifically, research on journalism and journalism education. Journalistica is a peer-reviewed journal in journalism research, published in Scandinavian languages and English, funded by Danish journalism education institutions. MedieKultur is a peer-reviewed journal of media and communication research, published in Scandinavian languages and English by SMiD, the Association of Media Researchers in Denmark. Nordicom Review is a peer-reviewed journal published in English and given out by the Nordic Information Centre for Media and Communication Research Nordicom. Nordisk kulturpolitisk tidskrift is a peer-reviewed journal on cultural policy published in Scandinavian languages and English, funded by Nordic research institutions. Norsk medietidskrift is a peer-reviewed journal published mainly in Norwegian but also in other Scandinavian languages and English by NML, the Norwegian Association of Media Researchers . Northern Lights: Film and Media Studies Yearbook is a peer-reviewed journal focused on research on film, television and new media, published in English. WiderScreen is a peer-reviewed journal on multimedial, audiovisual and digital media culture, published in English and Finnish. Nordic Journal of Information Literacy in Higher Education (NORIL) is a peer-reviewed journal that publishes research articles, best practice articles and book reviews in English. Nordic Journal of Digital Literacy is a peer-reviewed journal that publishes articles dealing with digital literacy and the use of ICT in education, given out by The Scandinavian University Press in collaboration with the Norwegian Centre for ICT in Education. Scandinavian Journal of Educational Research is a peer-reviewed journal focused on research on education in the Nordic countries, published in English. Nordidactica – Journal of Humanities and Social Science Education is a peer-reviewed journal on teaching and learning in subjects close to media and communication such as political science, history and civics, published in Scandinavian languages and English, given out by Centrum för de samhällsvetenskapliga ämnenas didaktik (CSD) at Karlstad University. 16:9 is a Danish peer-reviewed journal focused on film studies, published in Danish and given out in Aarhus. Culture Unbound: Journal of Current Cultural Research is a peer-reviewed journal in cultural studies, published in English by three research units at the Linköping University. Nordic Journal of Aesthetics is a peer-reviewed journal focused on research within arts and aesthetics with a Nordic scope, published in English. Sensorium Journal is a peer-reviewed journal for interdisciplinary questions on aesthetics, technology and materiality, organized around the Sensorium Network at the Linköping University. Nordic Journal of Literacy Research is a peer-reviewed journal for culturally oriented literacy research, which includes the research on reading, writing and literacy practices and education, published in Scandinavian languages and English. Journal of Media Innovations is a peer-reviewed journal on research on media technology, policy, organizations and management, published in English. Nordic and Baltic Journal of Information and Communications Technologies is a peer-reviewed journal on technological, economic, social and political developments in the ICT field in English. Lambda Nordica is a journal dedicated to LGBTQ and Queer Studies, publishes articles in Scandinavian languages and English. NORA: Nordic Journal of Feminist and Gender Research provides a Nordic perspective on feminist and gender research with articles published in English. Besides the established large Nordic organizations for cooperation, such as the Nordic Council of Ministers and its infrastructure for the funding, administration and development of research (e.g. NordForsk), there are a number of research-related platforms and networks. Nordicom, the Nordic Information Centre for Media and Communication Research, is a knowledge centre that collects, adapts and mediates knowledge and statistics on the Nordic media (research), provides a database for Nordic media research as well as gives out journals and anthologies reporting Nordic media and communication research. You can also subscribe to regular newsletters on media trends and policy. The International Clearinghouse on Children, Youth and Media is part of Nordicom, focuses in particular on research and practices around children, youth and media literacy. Journalism Research News is a project for mediating information on the latest European and international journalism research, operated by the University of Jyväskylä in Finland, funded by Helsingin Sanomat Foundation. The national researchers’ unions regularly organize conferences, seminars, workshops and other events touching upon topical questions in research: SMiD in Denmark (Sammenslutningen af medieforskere i Danmark), Mevi in Finland (Finnish Association for Media and Communication Studies), NML in Norway (Norsk medieforskerlag) and FSMK in Sweden (Föreningen för svensk medie- och kommunikationsforskning). There is a number of online magazines in media and communication discipline discussing recent research such as Nordicom Information, a journal published in thematic issues in Scandinavian languages and English for media and communication researchers, practitioners and policymakers, the Norwegian Vox Publica by the University of Bergen and InfoTrend by and for Nordic information specialists. In addition, news on media research are disseminated as part of the news flows of national science communication portals such as Forskning.no (see news on media research), Forskning.se (news on culture and society), Videnskab.dk (news on media research), Kommunikationsforum.dk (news on media research), Tietysti.fi (news on culture and society), and the Nordic portal published in English, ScienceNordic (news on society and culture). On Facebook there are closed Nordic groups operated in English such as Scandinavian scholars and Nordjour (Nordic teachers) in addition to the pages and groups created by the organisations mentioned above. Many individual media scholars are regularly curating and moderating Facebook groups on specific research topics, such as Nyhedernes sociale ansigt by Lars Holmgaard Christensen, Forum for konstruktiv journalistik by Karen Lumholt and Lotte Rosdahl, and Innovaatiot ja journalismi by Turo Uskali. In Denmark, there is a number of different Facebook groups for ”nørder” (nerds) in different fields of communication – see, for example, the group Kommunikationsnørder – den hårde kerne for a complete list of different groups. Nowadays, the numerous platforms of social media may provide us with a direct contact to an individual media or communication scholar. The use of social media for scholarly purposes has become more popular in the Academy; however, it is still not very easy to find, for example, bloggers specialized in media and/or communication research. Maybe it is just that the cobbler’s children are the worst shod, as the old saying goes? From Denmark: Active bloggers include, for example, the journalism researcher Aske Kammer at the University of Copenhagen, Associate Professor Torill Elvira Mortensen at the IT University of Copenhagen, and Rasmus Kleis Nielsen, Director of Research at the Reuters Institute for the Study of Journalism at the University of Oxford, the UK. From Norway: Associate Professor in Digital Culture Hilde G. Corneliussen at the University of Bergen, Associate Professor Bente Kalsnes at Oslo and Akershus University College of Applied Sciences, and Professor in Digital Culture Jill Walker Rettberg at the University of Bergen. From Finland: Almost all the Finnish media scholars blog in Finnish, such as the co-blogging media professors Janne Seppänen from the University of Tampere and Esa Väliverronen from the University of Helsinki, as well as, for example, the political historian Mari K. Niemi who blogs for the magazine Suomen Kuvalehti. From Sweden: Most of the blogging journalism and media researchers are gathered to the blog portal Medieforskarna which hosts 17 blogs altogether. In addition, Professor of Political Science Henrik Ekengren Oscarsson blogs on electoral studies, and researchers in political science have a blog community of their own, Politologerna. In addition, you should not forget the active tweeters in the Nordic countries. On Twitter you can find research-related topics, among other things, with the hashtags #medieforskning, #jagforskar, #journalistik, #Nordpub, #NordicomOA, and the varying conference hashtags (e.g. #NordMedia2017, #NordMedia2015, #Nordmedia2013 etc.). Do you miss something essential on the list? Please do not hesitate to mail your suggestions to the author. Maarit Jaakkola works as a postdoctoral researcher at Nordicom at the University of Gothenburg, Sweden, and as a lecturer in journalism at the University of Tampere, Finland. You can reach her at maarit.jaakkola@nordicom.gu.se.